We've done it again! ...Well, actually this all happened nearly three years ago but it's still exciting. 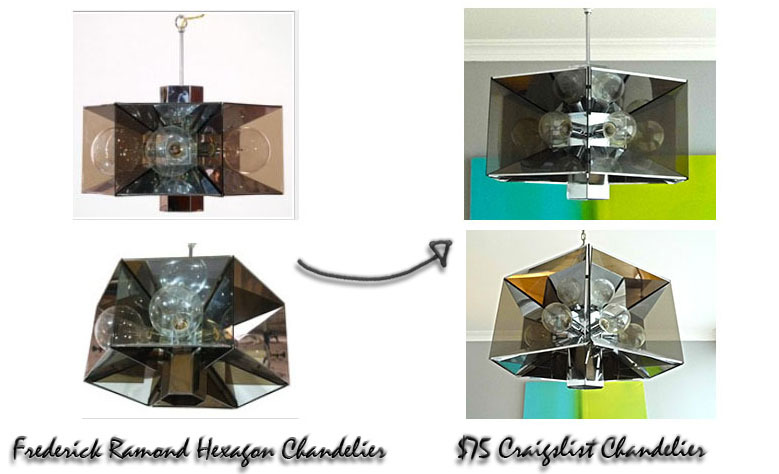 My last Craigslist Score post was so popular (maybe 10X as popular as my average post) that we thought we'd delve into our bag of tricks (aka- the condo) to see what other Craigslist treasures we might have found that could actually have some real value. So let's rewind about three years to the time when we had a firm offer on our condo but had not yet moved in. At the time, I was trolling Craigslist like a fiend, DIY-ing art for the living room (so there was paint everywhere,) reupholstering chairs and basically trying to pack everything into the living room of my teeny tiny 450 square foot apartment. It was hoarder madness! I seriously had to use some acrobatic moves just to get to the kitchen! We were already out for the day running errands so I ended up making an appointment to see the seller. 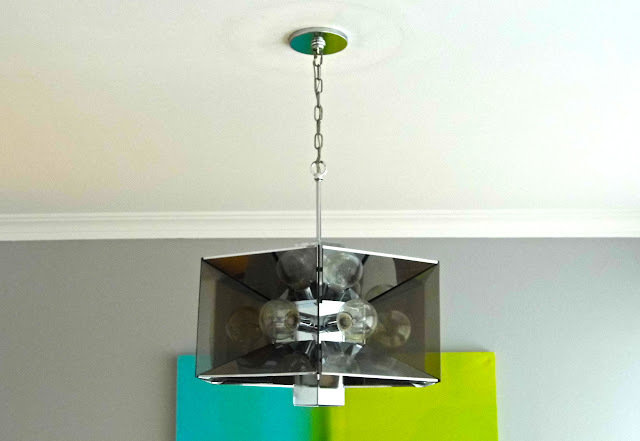 Part way through the morning, I stared at the picture of the chandelier that I had printed from Craigslist and told Corey that I was having second thoughts. I thought it was a little too obvious or kitsch or... just too... something. At that point Corey turned to me and said firmly, "We're getting it. This one's my decision." Folks, this was a real turning point for the guy who, until this point, had been a little horrified at my crazy taste in home furnishings and had really wanted no part in the actual decorating of our condo. I guess he had finally decided that this was going to be OUR home! When we arrived at the seller's home, the man selling it was obviously a little disappointed to be letting the lamp go. We asked him more about the situation and he explained that he had bought it at a church bazaar for $150 but his wife hated the thing and wouldn't let him hang it. He had saved it in his garage for ages but it was time to let it go. He really loved it and since we all knew it was probably worth more, Corey and I didn't even negotiate the price. Instead, we paid him the $75 and promised to give it a good home. Anyway, we cleaned it and it needed some minor electrical work and once we finally moved, we hung it in our dining room. 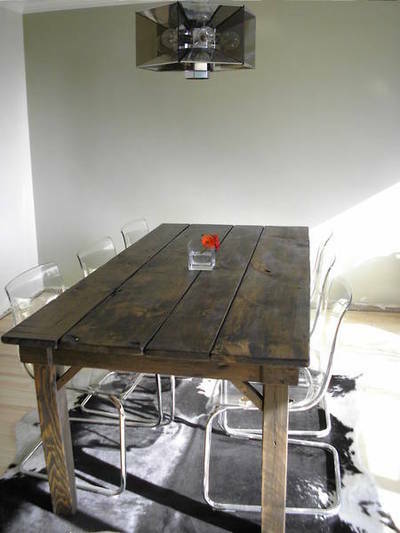 Aside from our harvest table and a few other items, it was one of the first furnishings in our new pad. Corey hung it before we even had baseboards (below) and, it grew on me quickly since it kind of added to the funky vibe that we had wanted. It was shortly after we moved in that I came across an HGTV House Tour (photo below) of the home of designer and Design Lab blogger, Arren Williams. 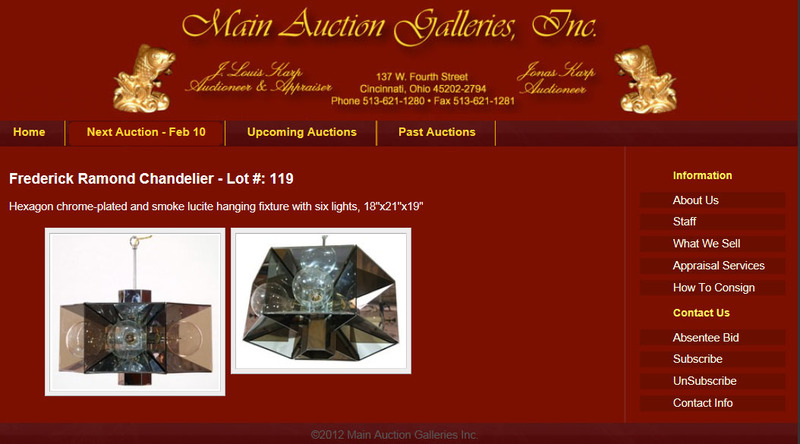 Our ugly/funky chandelier was in his living room!!! How cool did we feel?! I didn't even care if he was using it ironically (since we sort of were too) but I wanted to know more about that lamp. I tried to contact Arren through his blog to ask if he knew more about the lamp but I never heard back. I did send the article to the Craigslist man who had sold us the lamp... I joked that I hoped it would help him win the next decorating debate with his wife. Time passed and life happened and Corey and I forgot all about our quest to find the designer of our ugly/funky lamp... Until my post on the Craigslist director's chairs became so popular and many of you asked if it was a one-time fluke or if we had found any other "treasures" over the years. I took a quick inventory of the condo and remembered my lamp. So I checked online, searching key words and found a lamp that looked almost identical being sold on Main Auction Galleries Inc. They didn't list a price (and I was too busy last weekend to call) but most of their items were reasonably valuable. 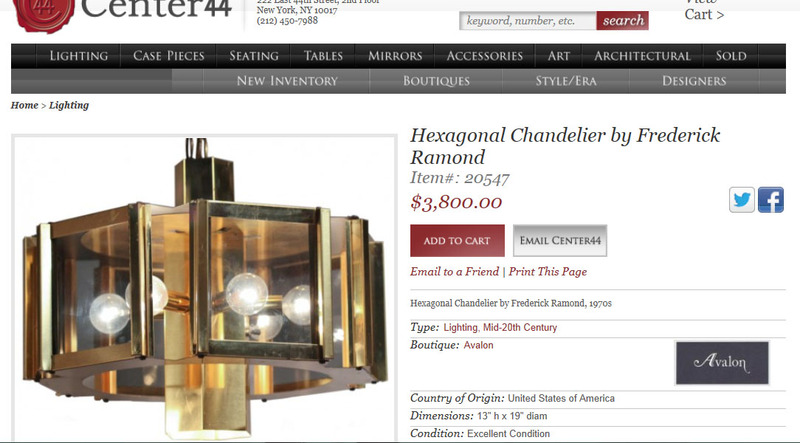 At least now I had a name of the designer to help me search: Frederick Ramond. Yowza, right? Well, although I originally found it, Corey talked me into this one! We are also grateful to the Craigslist seller who loved it so much that he brought it home from a church bazaar, knowing that his wife probably wouldn't approve. We hope he gets to choose their next lamp!